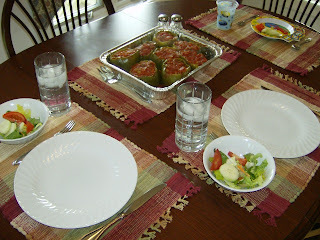 Weight of the Evidence: Stuffed Peppers ala Controlled-Carb! Would the recipe work with red or orange peppers, or would they get too soft? I can't handle green peppers - I'd be "experiencing" them all night. But the sweeter ones are fine for my system. I would think any color pepper would work - green, red, orange or yellow...the sweeter ones may not need the pre-prep in the microwave (or oven) before baking. I'm one of those who can't handle green peppers, either and have always swapped the green for red, orange, or yellow peppers whenever they are called for. I've found that any color makes for a dandy stuffed pepper and to treat them the same way that you would the green ones when prepping them including steaming or parboiling prior to stuffing.